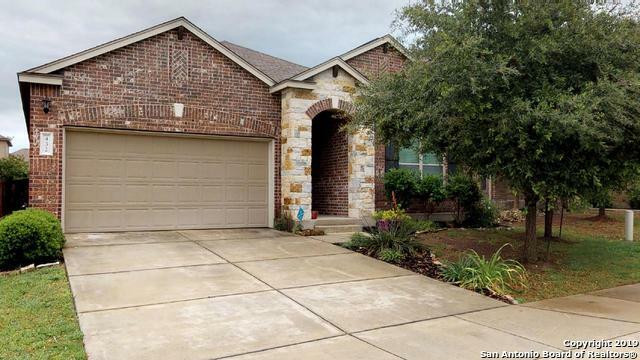 All SADDLE CREEK RANCH homes currently listed for sale in Cibolo as of 04/25/2019 are shown below. You can change the search criteria at any time by pressing the 'Change Search' button below. 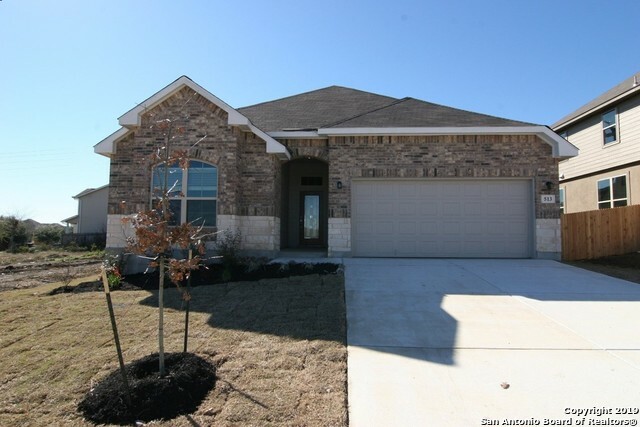 "Gorgeous, nearly new home in the heart of Cibolo. This immaculate home offers a downstairs master with an amazing pushed out sitting area with room for relaxing! Downstairs laundry room offers a mud room area with LOTS of storage! Jack and Jill bathroom and bedroom combo as well as a 3rd bed and bath upstairs. Beyond the french doors in the game room is an outdoor sitting area. Save money on the electric bill in this very efficient home! SOLAR PANELS AND A DUAL, HYBRID WATER HEATER have been "
"New Bella Vista home in Saddle Creek Ranch! Addison plan 2667sqft. Home features an open layout and includes a study, formal dining room, and a bonus room with a full bedroom, bath and gameroom. Kitchen includes stainless steel appliances with double ovens, granite countertops, upgraded tumbled stone backsplash, 42 upper cabinets and a blanco silgranit sink. Master suite has a bay window and a large walk in shower with mosaic tile accents. This home is complete with covered patio & sprinkler sy"
"New Bella Vista home in Saddle Creek Ranch! Addison plan 2678sqft. Home features an open layout with a study, formal dining room, and a bonus room with a full bedroom, bath and gameroom. Kitchen includes stainless steel appliances, granite countertops, upgraded backsplash, 42 upper cabinets in Ivory and an upgraded sink. Master suite has a bay window and a large walk in shower with upgraded tile surround. Home is complete with a water softener pre-plumb, full sprinkler system, and extended cover"
"Wow look at this pool! Beautiful home ready for its next family. Enter an inviting foyer leading to a separate dining and open living area. Enjoy family time in the downstairs media room or upstairs game room. This home boasts a well designed floor plan to accommodate all and the master bedroom and bath is a true retreat. Relax and enjoy the in-ground pool and surrounding deck and covered patio or take a stroll around the community pond. Near major shopping areas and Randolph AFB. A must s"
"New Bella Vista home in Saddle Creek Ranch! 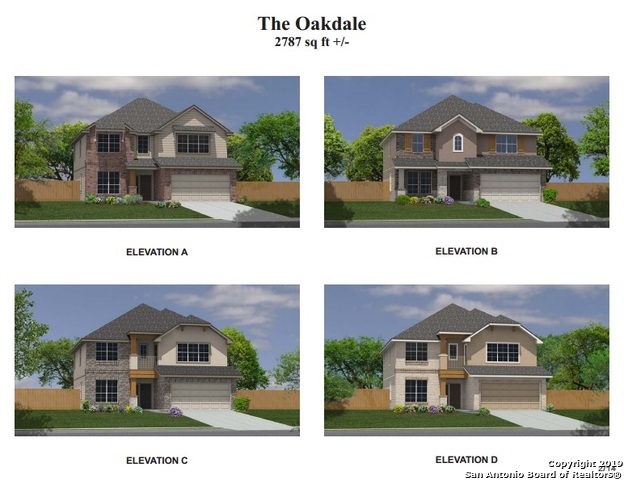 Oakdale plan 2791sqft. Plan features an open layout that includes a bedroom and full bath downstairs and a gameroom. The grand kitchen includes stainless steel appliances, granite countertops, 42 ivory upper cabinets, and tumbled stone backsplash. Tile floor is in all wet areas including the family room. The staircase is adorned with metal railing. 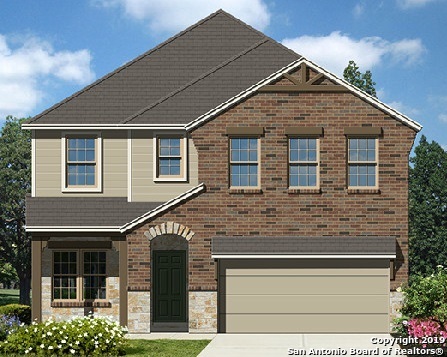 Home is complete with an extended covered back patio, zone damper system, 2 faux blinds & water softener "
"New Bella Vista home in Saddle Creek Ranch! Wheeler plan - 2674sqft. Plan features the master bedroom downstairs and includes a media room and formal dining room. The grand kitchen includes stainless steel appliances, 42 upper cabinets, tumbled stone backsplash, upgraded tumbled stone backsplash and pendant lights over the island. Master suite has a bay window and large walk-in shower with mosaic accents and tile surround. 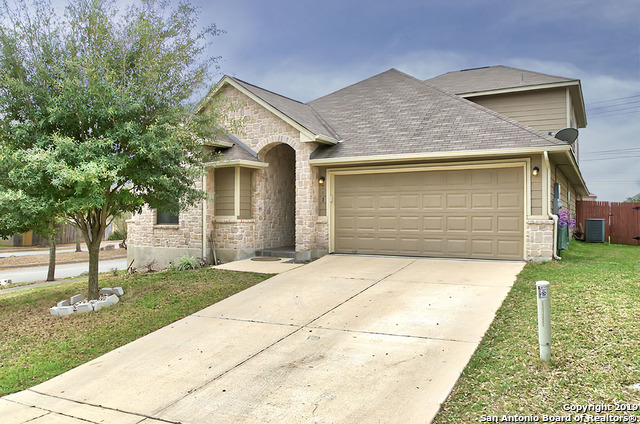 This home is complete with a covered back patio & sprinkler system!" "New Bella Vista home in Saddle Creek Ranch! Wheeler plan - 2667sqft. Home features an open layout and includes a media upstairs and formal dining room downstairs. Kitchen is open to the living area and includes stainless appliances, 42 upper cabinets, upgraded tile backsplash, and granite countertops. Tile floor is in all wet areas including the family room and formal dining room. Home is complete with a covered back patio, sprinkler system, and water softener pre-plumb!" "Entertainers backyard! Large covered patio with outdoor kitchen! This home is like new and ready to move in. Large master suite with sitting room and 8ft walk-in shower. Kitchen has granite counter tops, stainless steel appliances and 42 cabinets. Upgraded, larger tiles throughout except bedrooms. Convenient location-not too far from San Antonio or Austin. Come enjoy this great home in Saddle Creek Ranch!" "New Construction. Home Ready to Move In. Visit Model Home to See this Home. 2464 Sq. 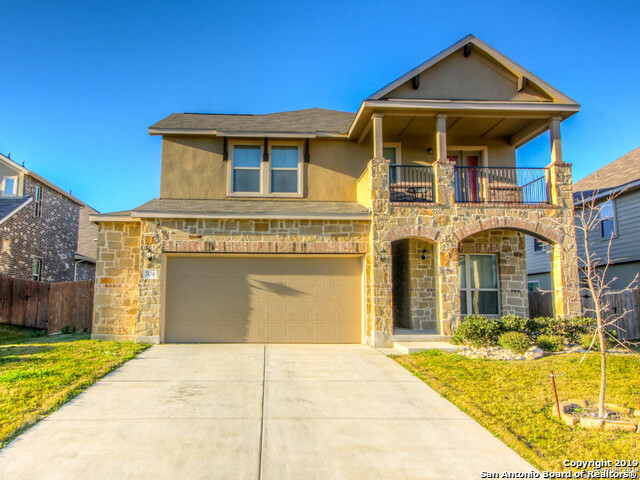 Ft. 4 beds/ 2.5 baths/ 2 story/ 2 car garage/ 3 sides masonry on first floor! Luxury features include master suite & 8ft walk-in shower at master bath! Gourmet kitchen has granite counter tops, stainless steel appliances. A covered patio and full sprinkler/irrigation system complete this gorgeous home!" "New Bella Vista home in Saddle Creek Ranch! 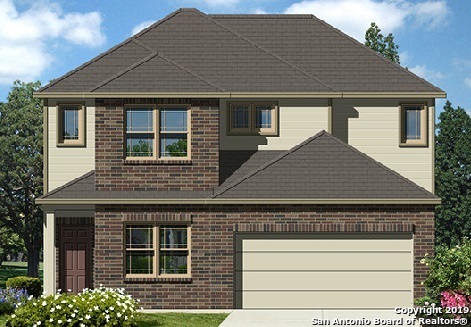 Sterling plan 1986sqft. . Home features a study and open layout. Kitchen includes granite countertops, 42 upper cabinents, upgraded tile backsplash, and a box out window in the dining room. Cozy up to the 36 wood burning fireplace with upgraded tile surround. Master suite has a bay windows with a large walk in shower with tile surround. Home is complete with a covered back patio, 2 faux blinds, garage door opener, water softener pre-plumb & sprinkler s"
"New Construction. Home Ready to Move In. Visit Model Home to See this Home. 2596 Sq. 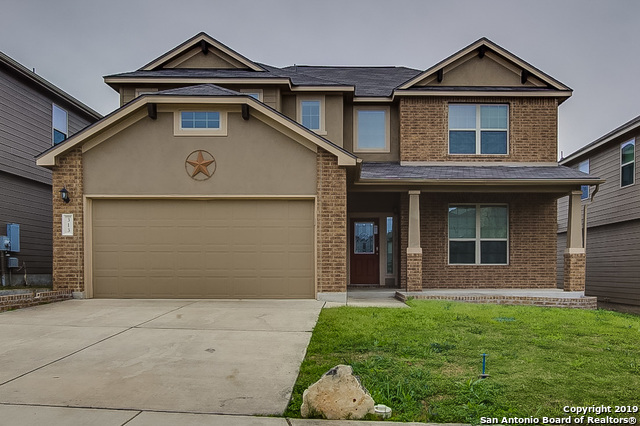 Ft. 4 beds/ 2.5 baths/ 2 story/ 2 car garage/ 3 sides masonry on first floor! Gourmet kitchen has granite counter tops, stainless steel appliances. A covered patio and full sprinkler/irrigation system complete this gorgeous home!" "Beautiful 1 1/2 story home in Saddle Creek! Situated on a corner lot, this home has a bright, open floor plan with a huge gourmet kitchen overlooking the family room. All bedrooms down with a large game room or additional bedroom with a full bath upstairs! Large,elegant master has a bay window, garden tub & separate shower with double vanity. Newer flooring, deck & gutters. Come see it today!" "Come view this beautiful home. Step into the foyer of this spectacular 4 bed, 3 1/2 bath home and view the openness and light filled rooms. This home has all the upgraded features. Kitchen has granite counters and a huge island along with stainless steel appliances. The home boast 2 living areas along with an upstairs guest suite. The outside balcony is a lovely area to have coffee or glass of wine and enjoy the view. Just waiting for a family to enjoy the surroundings. This can be you!" 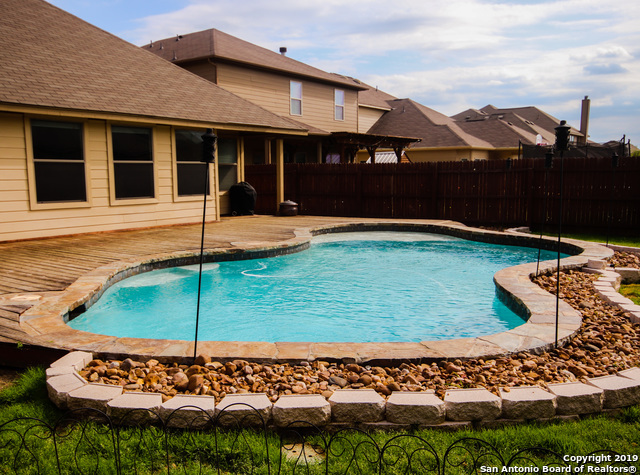 "Pull in from a long day, walk out to your back yard and enjoy your private oasis with pool and outdoor entertainment area and let your stress slip away. This home has many terrific features that you will enjoy, from the outdoor entertaining, huge master bedroom with dual closets, large bedrooms, great kitchen and so much more. Located near I35, getting around town for a quick trip to shopping, entertainment, military bases and downtown Cibolo has never been easier. 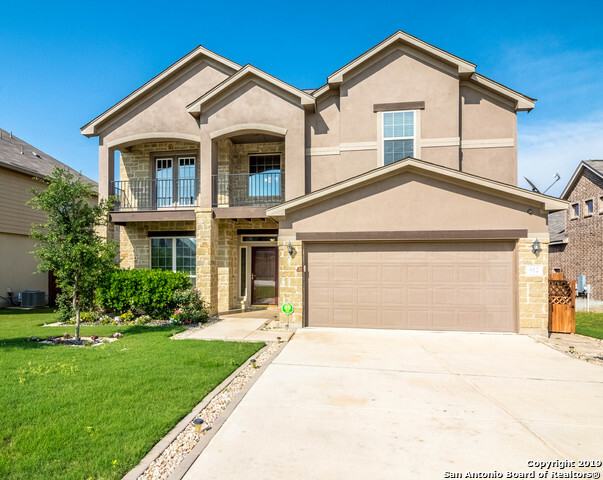 Hurry, this gem won't last lo"
"Built in 2014, this Cibolo two-story offers stainless steel appliances, granite countertops, a loft, and a two-car garage. Upgraded features include a new roof. Home comes with a 30-day buyback guarantee. Terms and conditions apply." "Traditional in style, this home exudes warmth & exceptional quality from the moment it meets the eye. The lower level lends itself to light, & tile floors ease upkeep duties. The 4 bedrooms have all new carpet & delightful window bench seating. Tile is laid in the 2.1 baths, & the entire home has been repainted. The gorgeous dining room caters to formal entertaining & the quaint breakfast nook is a lovely spot for your morning coffee. Flowing to the sprawling lawn is a covered patio, ideal for T"